One of the greatest things that God wants believers to do is to help each other when we go through tough times. Whether it is physical or financial needs or even emotional and Spiritual needs, God wants us to bear one another’s burdens by esteeming each other above ourselves. However, to do this, we must be familiar with Scripture enough to know how certain passages apply to our lives to provide practical hope and direction. 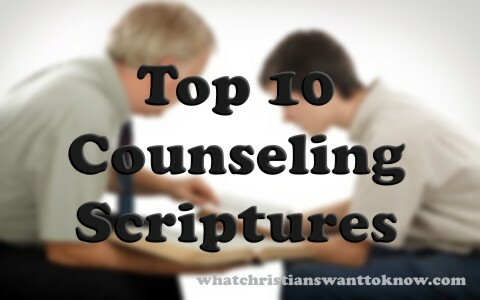 In my experience with Christ-centered counseling, the following top ten Bible verses, or passages to counsel fellow believers with commentary have proven to be very helpful (1). It is important that we refocus on reassuring our salvation any time we struggle or help someone who is struggling with a difficult life situation. By doing this we reaffirm in our minds that we are a child of God by faith in Christ (Galatians 3:26). As children of God, we can be assured that He loves us and has provided everything we need through the power of the Holy Spirit that lives within us to have victory. Likewise, we can understand that the Holy Spirit in us is greater than anything in the world that Satan can throw against us (1 John 2:12-17; 1 John 4:4). 2 Timothy 3:16–17 All scripture is given by inspiration of God, and is profitable for doctrine, for reproof, for correction, for instruction in righteousness: That the man of God may be perfect, throughly furnished unto all good works. Once we have refocused on our salvation, we must reassure ourselves that the Scriptures have direct instruction from God on how to handle everything we could ever encounter in life. This is because all the Scriptures are given by inspiration of God meaning they have been given to us by God Himself through the inspiration of the Holy Spirit. They are not just the wise sayings from human writers (2 Peter 1:16-21). When we embrace this truth, it helps us to trust what the Bible teaches about everything. We can understand how the Bible is profitable for doctrine, points out where we may have gone wrong, what needs to be corrected, and how we can correct it. James 1:2–8 My brethren, count it all joy when ye fall into divers temptations; Knowing this, that the trying of your faith worketh patience. But let patience have her perfect work, that ye may be perfect and entire, wanting nothing. If any of you lack wisdom, let him ask of God, that giveth to all men liberally, and upbraideth not; and it shall be given him. But let him ask in faith, nothing wavering. For he that wavereth is like a wave of the sea driven with the wind and tossed. For let not that man think that he shall receive any thing of the Lord. A double minded man is unstable in all his ways. Once we have reassured ourselves that God has an answer for everything in life, we must believe that He will provide a simple answer if we ask Him. This passage gives us two things to consider. First, when we go through tough times God wants us to rejoice or be joyful no matter what. This sets the proper mindset that will encourage us and others that God will bring great things out of the situation by giving us the patience, experience, and hope to move forward (Romans 5:3-5; Philippians 4:4-5). Second, God wants us to believe that if we ask Him for an answer to life issues that He will provide it if we ask in faith without wavering. This means that we must believe that He will give us what we need to have victory as much as we believe that God can save us. Only then will God provide the answers and strength to move forward in a way that pleases God (Hebrews 11:6). Philippians 4:6–13 Be careful for nothing; but in every thing by prayer and supplication with thanksgiving let your requests be made known unto God. And the peace of God, which passeth all understanding, shall keep your hearts and minds through Christ Jesus. Finally, brethren, whatsoever things are true, whatsoever things are honest, whatsoever things are just, whatsoever things are pure, whatsoever things are lovely, whatsoever things are of good report; if there be any virtue, and if there be any praise, think on these things. Those things, which ye have both learned, and received, and heard, and seen in me, do: and the God of peace shall be with you. But I rejoiced in the Lord greatly, that now at the last your care of me hath flourished again; wherein ye were also careful, but ye lacked opportunity. Not that I speak in respect of want: for I have learned, in whatsoever state I am, therewith to be content. I know both how to be abased, and I know how to abound: every where and in all things I am instructed both to be full and to be hungry, both to abound and to suffer need. I can do all things through Christ which strengtheneth me. Knowing that God will provide the answers we need if we ask in faith, we must literally engage in prayer any time we find ourselves being affected by the life issue we are struggling with. When we cast our cares and anxieties upon Him through prayer when we are in the midst of the firestorms of life, He gives us peace and keeps our hearts and minds at peace through Christ Jesus. Likewise when we continue to think upon the things that God tells us are true, honest, just, pure, lovely, of good report, virtuous, and praiseworthy, by the example of Christ, God continues to give us peace and contentment. Finally, in doing these things, it reassures us that we can do all things through Christ, which strengthens us. James 1:12–16 Blessed is the man that endureth temptation: for when he is tried, he shall receive the crown of life, which the Lord hath promised to them that love him. Let no man say when he is tempted, I am tempted of God: for God cannot be tempted with evil, neither tempteth he any man: But every man is tempted, when he is drawn away of his own lust, and enticed. Then when lust hath conceived, it bringeth forth sin: and sin, when it is finished, bringeth forth death. Do not err, my beloved brethren. In order to do all things through Christ, we must take an account of the possibility that our own choices and behaviors could be part of the problem. This means that we must first judge ourselves to see if we are doing anything wrong that needs forsaken along with asking forgiveness from God (1 Peter 4:12-19; 1 John 1:9). We must also realize that the root of our sinful choices and behaviors do not come from God. They come from our own lusts and temptations that draw us away from what God tells us to do, to instead doing what He tells us we should not do. In doing so, we commit sin, which kills off the good things in our life. James 1:19–25 Wherefore, my beloved brethren, let every man be swift to hear, slow to speak, slow to wrath: For the wrath of man worketh not the righteousness of God. Wherefore lay apart all filthiness and superfluity of naughtiness, and receive with meekness the engrafted word, which is able to save your souls. But be ye doers of the word, and not hearers only, deceiving your own selves. For if any be a hearer of the word, and not a doer, he is like unto a man beholding his natural face in a glass: For he beholdeth himself, and goeth his way, and straightway forgetteth what manner of man he was. But whoso looketh into the perfect law of liberty, and continueth therein, he being not a forgetful hearer, but a doer of the work, this man shall be blessed in his deed. With the proper attitude toward our own sinful choices and behaviors, we must replace our thinking that led to the feelings and emotions that tempted us to sin. We do this by engrafting the Word of God directly into our thoughts. We do this by proactively listening to Christ-centered music, reading Scripture, or even reciting Scripture memory verses. This changes our thinking, which changes our feeling, which changes our desires to do the right thing. However, we must be willing to do more than just hear the word, we must be willing to do what it says by faith that God will keep His promises to give us the answers and power to do all things through Christ. With the proper mindset, we must also surround ourselves with other believers in a good local church. This will provide a nurturing environment where we can interact with others and to strengthen and encourage each other to live our lives for Christ. God does this by providing people in different roles within the local church that can help us to grow as believers, participate in the work of the ministry, and strengthen the congregation of believers (Ephesians 4:1-14). Matthew 18:15–20 Moreover if thy brother shall trespass against thee, go and tell him his fault between thee and him alone: if he shall hear thee, thou hast gained thy brother. But if he will not hear thee, then take with thee one or two more, that in the mouth of two or three witnesses every word may be established. And if he shall neglect to hear them, tell it unto the church: but if he neglect to hear the church, let him be unto thee as an heathen man and a publican. Verily I say unto you, Whatsoever ye shall bind on earth shall be bound in heaven: and whatsoever ye shall loose on earth shall be loosed in heaven. Again I say unto you, That if two of you shall agree on earth as touching any thing that they shall ask, it shall be done for them of my Father which is in heaven. For where two or three are gathered together in my name, there am I in the midst of them. Sometimes overcoming life issues requires that we resolve our differences with other people. We do this by approaching them alone with the intent of resolving our differences in a way that pleases God. Our approach should be of humility and meekness (Proverbs 6:1-5; Galatians 6:1-10). If the person refuses to reconcile, then we should take one or two others so that every word can be confirmed. This means that we have someone that can mediate without taking sides suing God’s Word as their guide. If this still does not work, then we should take our matter to the church for proper disposition. 2 Timothy 2:15–19 Study to shew thyself approved unto God, a workman that needeth not to be ashamed, rightly dividing the word of truth. But shun profane and vain babblings: for they will increase unto more ungodliness. And their word will eat as doth a canker: of whom is Hymenaeus and Philetus; Who concerning the truth have erred, saying that the resurrection is past already; and overthrow the faith of some. Nevertheless the foundation of God standeth sure, having this seal, The Lord knoweth them that are his. And, Let every one that nameth the name of Christ depart from iniquity. It is important no matter who we are that we spend time each day so that we can become better disciples, or students, of Christ (John 8:28-32). This time of devoted study of the Bible will enable us to know what God defines as the truth, which will contrast with what we hear every day from the world. Knowledge of God’s truth will set us free by enabling us to rightly divide and understand His Word in a way that is logical and makes sense. Knowing what God says is normal will help us not to be deceived by the vain and profane babblings of the world that leads us away to the destruction of our life that comes from worldly ways. If someone is not in the habit of daily study, a good way to get into the habit is to read a chapter of Proverbs based on the day of the month. For example, read Proverbs 1 on the first of the month. Read any remaining chapters of proverbs (Proverbs 29, 30 or 31) as applicable on the last day of the month. Psalm 100 A Psalm of praise. Make a joyful noise unto the Lord, all ye lands. Serve the Lord with gladness: Come before his presence with singing. Know ye that the Lord he is God: It is he that hath made us, and not we ourselves; We are his people, and the sheep of his pasture. Enter into his gates with thanksgiving, And into his courts with praise: Be thankful unto him, and bless his name. For the Lord is good; his mercy is everlasting; And his truth endureth to all generations. When we participate in the daily study of God’s Word we can provide an answer to those that see the hope that is within us and that they can have (1 Peter 3:15). However, we demonstrate our hope by not only how we live our life, but also through our regular participation in worship of God. We worship God by making a joyful noise in singing and music, serving the Lord, and entering His gates with thanksgiving in our hearts for the fact that He is God and has made us. God is deserving of our praise and worship because He is good, His mercy for our salvation and redemption is everlasting, and His truth lasts forever. Worshipping with others who are struggling with life issues it the perfect way to thank God for His unspeakable gift of salvation and victory in our life (2 Corinthians 9:15). One of the greatest things that God wants believers to do is to help each other when we go through tough times. Therefore it is good to know specific verses and passages of Scripture that we can use to provide counsel to fellow believers. These top ten Scriptures will provide comfort and hope to those that receive them when we minister to them using the love of Christ. May God bless us in this effort. While it is not listed as the #1, I believe that Philippians 4:6–13 is probably the most popular passage we share with folks. It applies in all situations. Great collection here! Previous post: Should Politics Divide Christians? Next post: Who Were The Philistines During Bible Times?